Organic tree form bronze cocktail accented with flowers and pair birds, attributed to Willy Daro. 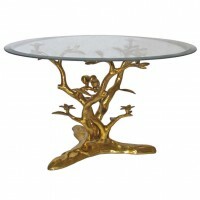 Table base can accommodate a circular, square or rectangular top. The table base is 18.5″ high x 23″ widest. Glass top shown not included with this item.